The Green Gaspeite is a fairly new gemstone to hit the jewelry market. It is mostly found in a light green to rich green color hue, hence the name. 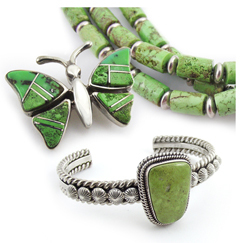 It tends to resemble a green turquoise but since this new gemstone has been discovered, it is considered to be more on the rare side to due its limited availability. It was first found and mined in Canada but a small deposit has also been found in New Mexico and a small deposit in Australia. This is a very soft gemstone and comes in on the Mohs hardness scale at a 4.5 to 5.0 so it needs to be protected so that damage doesn't occur. Because of the softness, it doesn't make a great gemstone for ring settings since we are typically hard on our rings. When looking to purchase a Green Gaspeite in the jewelry market, you will mostly find it in bead form that can be used in earrings, necklaces, bracelets and in pins. How to Care for Green Gaspeite: You should protect any jewelry pieces that contain Green Gaspeite from water, so no bathing, swimming, showering or cleaning while wearing Gaspeite jewelry. You should never store your jewelry in direct sunlight and protect it from extreme hot or cold temperatures. Another good tip is to protect your jewelry from chemicals in hair care products, cosmetics and from perfumes. If you need to clean your pieces, use a slightly damped cotton cloth and wipe it down. If it needs a deeper cleaning, we suggest letting a professional jeweler handle it since it is a delicate soft gemstone. This unique gemstone is a beautiful color and looks fabulous when set and incorporated into a lovely jewelry piece. Gemstones are good carriers of cosmic energy and can provide benefits to its wearer but only if it is worn rightly, if people worn them right, they provide their cosmic benefits otherwise they are just cosmetic and jewellery.